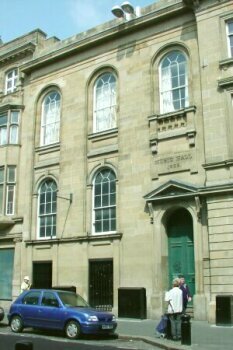 This Hall was built by Richard Grainger in 1838 as a replacement for the "Music Hall" which he had built on Blackett Street eight years earlier. It was used for lectures, exhibitions, concerts, bazaars and public dinners. By 1861, when Charles Dickens read excepts from his works there, it was known as The Lecture Room. 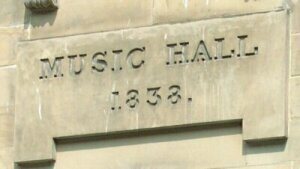 By 1879 it had become what we would recognise as a "music hall" and in that year its name became the New Tyne Concert Hall. From 1884 it was variously known as the Gaiety Music Hall or he Gaiety Theatre of Varieties. In the early 1890s, however, the hall was taken over by the temperance movement and renamed "Central Hall". The Central Hall hosted temperance meetings and lectures until 1911 when the building became a cinema - The Gaiety (Gaiety Theatre Picture Hall), though it was universally known as the "Pie and Tatie". This cinema lasted until 1949 when it was closed after failing an inspection by the licensing authorities. Most of the building was demolished in 1964, but the facade remains and is shown in the photographs on this page. It was a strange building - the theatre/cinema was on the first floor with a fruit wholesaler on the ground floor below. Or perhaps it would be more accurate to say that the theatre occupied the first and second floors, because the theatre had a balcony down both sides.